"North America has definitely been an engine. Everyone wants a piece of it." DETROIT -- Alan Batey's first year as General Motors' head of North America was about survival, as a deadly ignition-switch defect in older small cars triggered a landslide of some 30 million recalled vehicles and plenty of bad publicity. Despite the safety crisis, GM's U.S. market share last year barely budged. Meanwhile, the drop in fuel prices was timed perfectly for GM's redesigned lineup of pickups and SUVs. Yet GM's market share through April this year was flat at 17.6 percent amid a steep slide in GM car sales. Batey says he wants growth, but he insists that GM won't chase market share, as it did in the past. He's taking a long-term view as GM works to revitalize Chevrolet and Buick while accelerating the momentum of its upscale truck marque, GMC. Batey, 52, spoke May 4 with Dave Versical, Automotive News' director of editorial operations; Print Editor Richard Johnson and Staff Reporter Mike Colias. Q: What do you see industrywide in terms of demand? Do you still see pent-up demand? A: Yeah, I do. I still fundamentally believe that it's a fantastic time to buy a vehicle. We've got low interest rates, low fuel prices, good access to credit and the widest range of vehicles probably that the market has ever seen. We said early in the year that we thought this year could be a 17 million [light-vehicle] market. I'm probably even a little more optimistic now. How can there still be pent-up demand when we're six years into the recovery? The average vehicle out there is still over 10 years old. Used values are still very strong. God bless Americans. We know that when they've got money in their pocket, they're likely to spend it. They're seeing the value in buying automobiles. The other thing is, if you've got a truck that's over 10 years old, when you get into a new one, you're going to get immediate benefits on things like fuel economy. There's definitely pent-up demand. We think that will continue. What has the pricing environment been like? The ones who have been really aggressive are Hyundai and Nissan, particularly on the car side. Interestingly enough, it doesn't seem to have translated particularly well with regard to their sales. Honestly, we've tried to remain pretty disciplined. It's a competitive market. I would definitely say we've seen some of the Japanese be extremely aggressive. If you look at their [incentive spending] as a percentage of average transaction prices, these are levels we haven't seen at least during my time here in the last 51/2 years. Historically, that's unusual. It was always everyone pointing to the Detroit 3 for big incentives. Isn't that true? Historically, [the Asian brands] actually would not discount, they would add content. I think some of that is because the shifts in the market have happened pretty quickly. They don't compete in the segments that are growing. And they've got pretty high inventory levels. They also have relatively aggressive CEOs who can't rely on growth in markets outside North America. As you look around the world -- I compare notes with the other GM regional presidents -- without doubt, this is the only one that's got buoyancy and growth, other than China, which is growing but at a slower pace. North America has definitely been an engine. Everyone wants a piece of it. Is GM able to keep pace with SUV demand? Dealers still can't get enough, nearly 18 months after the redesigned models came out. We're making as many as we can. What's the definition of oversupply? One unit. We're in a situation where our inventories across [Cadillac, GMC and Chevy] are very tight. But we'll build everything we can because we do have great demand. 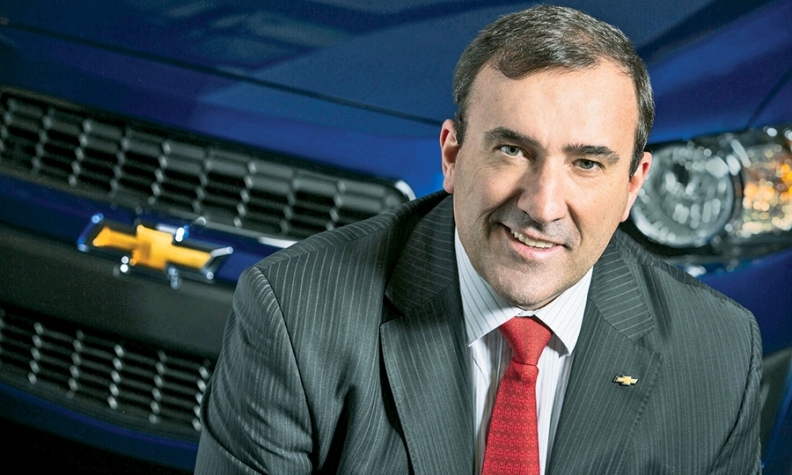 GM purchasing chief Steve Kiefer recently said that GM is trying to eliminate supplier bottlenecks on the SUVs. That's where we're at right now. People often say, "Why can't you ramp it up more quickly?" The issue is, it's a cyclical business. So you're always balancing for the bottom of the cycle as well as the top. If somebody told me 12 months ago that we'd be sitting with this fuel environment, I probably would have been interested to hear why you'd think that. But I wouldn't want to predict where it might be next year or the year after. Right now, we're adjusting supply. We have taken some car production down this year, simply because we're not going to get into an incentive war. We need to build these brands to protect our residual values. What does GM do about Buick, which is probably suffering a little bit because of its heavy car mix? Yeah, on the car side of the business, like most in those segments, you see a decline. Obviously, Buick is benefiting from the fact that they've got two really strong crossovers. The Encore is doing really well. [Buick-GMC chief] Duncan Aldred would like to get as many as he can. He still sees more upside. And then Enclave continues to do really well. That's what balanced it somewhat. And then he's got probably one of the hottest brands on the market right now with GMC. When are used-car values going to start to level off? There definitely was a shortage as we came out of the financial crisis, because leasing just dried up. Now we're starting to see those vehicles coming back. The industry is running at about 25 percent [lease penetration]. We're running at about 23 percent. But historically, that's not beyond where the industry has been. We're seeing that resale values are high right now, and we don't see a reason that can't continue. We've also put in a lot of effort with our dealers on [certified pre-owned sales]. If we can get those vehicles out of lease and get them back and onto our used-car lots, we're starting to build our customer base and build those relationships. How does GM Financial help in that effort? As we progress to a more captive-finance model, we're going to have control of a lot of inventory coming back. We like leasing. We see loyalty rates on leasing higher than on purchase. We also like the fact that we can get these customers back in two or three years. But we want to lease in a very controlled manner so we build our residual values. When I first came here and looked at cars like the Cobalt versus Corolla or Civic, we had like a 10-point gap on residuals. That kills you. We've worked really hard to build residuals. What else does GM need to kick up market share a couple clicks? I'm a realist. It's going to take us a decade or more to really rebuild these brands. The hardware, the product, is one thing. I think we've demonstrated that with vehicles like the Impala ... and with the Volt. We're showing we can really execute and deliver. I think the perception now is lower versus the reality. In my mind, that's opportunity. I think over time, you're going to see those brand-health measures move and our customer retention improve. So you don't expect a market-share gain this year, but do you have a figure in mind for the future? There's not a number out there. We want market share to be an output, not an input. We've got to execute with excellence. We're not going to get away with mediocre or boring. Our designs have to be stunning and leading. We have to take that medium- to long-term view. Buying market share is not the way to go. But make no question about it, I want to grow. Would you welcome more interest in automotive retail from investors like Warren Buffett? I always think that change is good. Everything that happened with Tesla, that was good. We need people like that who are challenging the status quo and providing that competition because it brings the best out of us. The one thing about our industry is that it's very intense and competitive. It's not a 9-to-5 job. The great dealers across this nation are dealers who work really hard. They earn their dollars. This is not an industry for the faint-hearted. So I think there's a place for everyone in a network like ours. There's a place for the publics and the entrepreneurs. Have you seen many GM stores change hands recently? No. Very little activity right now. In the first quarter, the numbers were 10 transactions across the nation. That's incredible. I think there's a lot of people who want to get in, and there's a lot of people who are making really good returns and believe in where we are and see a lot of upside. I also think that the whole interest around Warren Buffett brought another level of optimism and confidence in the franchised dealer network.